Architectural practice is becoming increasingly more collaborative. For people like me, that kind of environment is exciting and energizing. For others, it can be suffocating and distracting for work. Achieving a balance is important. As designers, we have told our clients about the great benefits of good office design in terms of productivity and innovation. That said…it’s time for us to apply those principles for ourselves! As many firms are seeing, the need for collaborative work spaces is growing. Spaces for trading creative ideas, learning new skills/technologies, and interacting professionally and socially will be and are imperative for a successful firm. 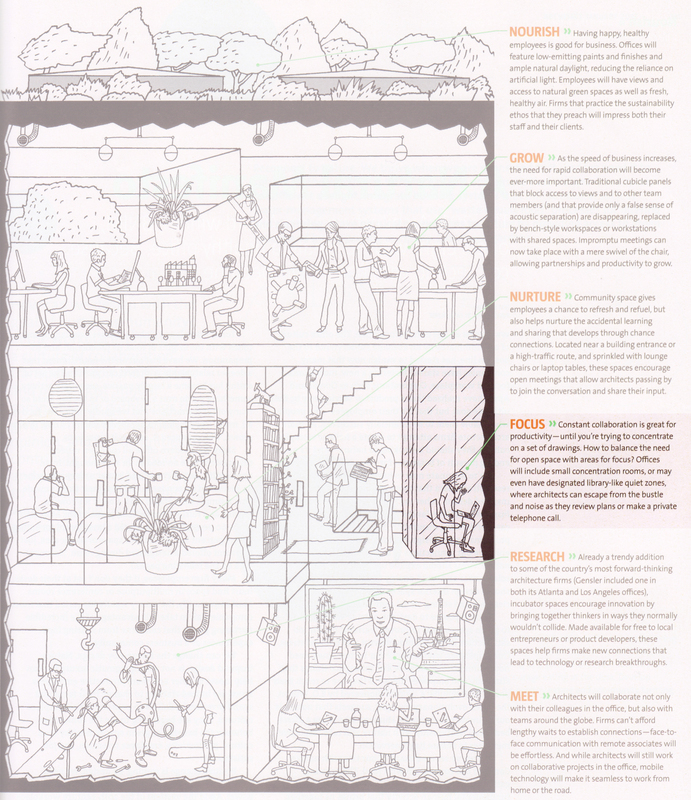 Architects and designers also need those private, quieter spaces to pursue solo endeavors, research, and hold private discussions. What, then, are the directions we can take? Much of the traditional office design model accomplished the needs of the private user very well – offices around the perimeter of the building allowed for someone to privately work on drawings, brainstorm an idea, or have a quiet conversation with a client. In today’s office, however, we also need more spaces for several colleagues to get together and discuss a project, perfect a drawing set, or have a brainstorming session on the next big idea. In my office, for example, our small “team room”, once used for brainstorming sessions and group discussions, has been a staging area for temporary interns. The office staff has certain felt the negative impacts, as there have been limited areas for collaboration. Wait, what about those focus spaces?! So far, the conversation is heavily focused on collaborative spaces, and you are probably asking yourself, “Ryan, when are you going to talk about focus spaces?” With so much collaboration, focus spaces are even more important. Concentration spaces are becoming more prevalent in offices as well, with rooms located close-by the work areas. Staff can review drawings without distraction, have a private conversation, or even have meetings with product developers that can help fuel innovation. Hence, the INCUBATOR SPACE! One of my favorite “incubator spaces” I’ve seen recently was one I saw on Contemporist‘s website. It is at the Youth Republic Office in Istanbul, Turkey, and the images don’t disappoint! They’ve taken and landed a semi-private room smack in the middle of their open office space. 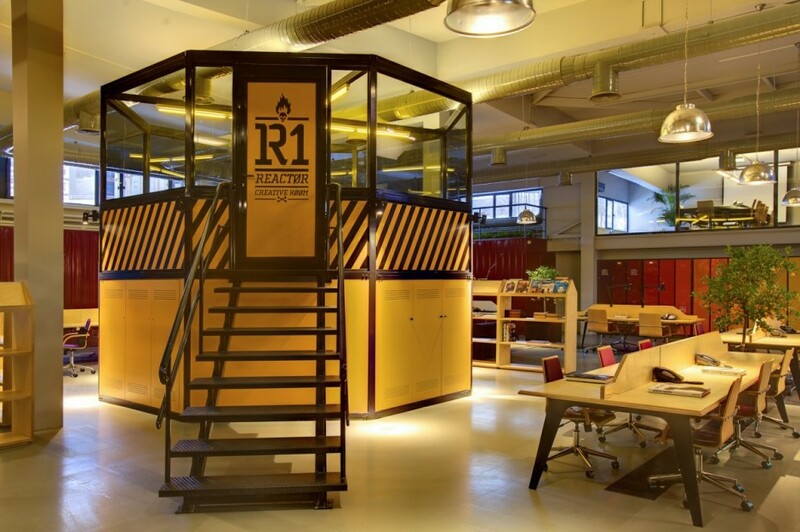 They even gave it a cool name…the R1 Reactor Creative Room. I can not help but get excited by this space! Many aspects of the office give you energy, collide you with colleagues, and give you inspiration…while the “reactor room” and other private rooms give you the opportunity to focus and have intimate discussions. Click on the link above to see additional photos! …and I couldn’t agree more! I would love to hear your comments! Please leave your ideas/thoughts in the comment field below, or email Ryan at ryan@toastingdesign.com. Stay tuned for Part 4: Nurture next Monday, May 28th!